Eire - In late June a capacity crowd of 18,000 gathered at Musgrave Park in Cork as the multi-national vocal supergroup performed their 2013 album ‘A Musical Affair: The Greatest Songs Of Broadway Live’. Joined for the night by The City of Cork Symphony Orchestra, who also performed a full programme of popular music, the 5-hour event featured several well-known Irish acts in support. Formed in 2004, Il Divo have sold over 26 million albums, their global popularity being at least partially attributable to their ability to record in Spanish, English, Italian, French and even Latin. They have collaborated with numerous other major artists, most notably Barbra Streisand with whom they have toured extensively. Full production (including audio, lighting, video and staging) for the event was provided by Dublin-based EQ Events, a long-term Outline owner who have used their Butterfly systems with great success on many different types of project over a number of years. EQ deployed just twelve GTO C-12 enclosures per side as the main PA, with small clusters of Butterfly modules used for outhangs and delays. 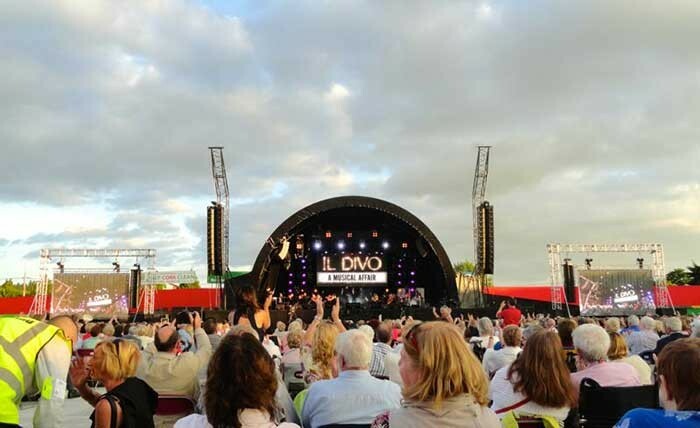 However, as EQ Events MD Shay Hannon explains, the latter loudspeakers turned out to be superfluous: "As a dedicated Outline Butterfly user we had been champing at the bit to get our hands on the new GTO C-12 series for the Il Divo arena show in Cork. Despite having heard so many good things about the new Outline system, when we actually used it we were stunned with its performance, its simplicity to rig and its power to weight ratio’. He continued: "The system was flown literally in a matter of minutes, slashing time & labour expense – its integral rigging system is so simple and efficient. Most impressive however was the warmth of its reproduction and its ability to throw the HF over a massive distance – we were getting full HF coverage at 130 metres from the main system, so we just didn’t need the delays we put in." Outline’s UK distributor CUK’s Rich Soper said: ‘It’s always a pleasure to see and hear the GTO C-12 in use - as Shay points out its intuitive rigging allows it to be flown astonishingly quickly and just sounds simply stunning." He continued: "‘In the short time it’s been available the GTO C-12 system has gained a great deal of support from major touring acts whose engineers have come to realise there is - at last - a serious alternative to the same old systems everywhere, one that doesn’t require ridiculous amounts of time to set up and which comprehensively out-performs many other systems. GTO C-12 genuinely enhances return on investment for a rental company and it keeps the engineers, audiences and artists smiling from ear to ear."